Explore your most valuable transferable skill: creativity. 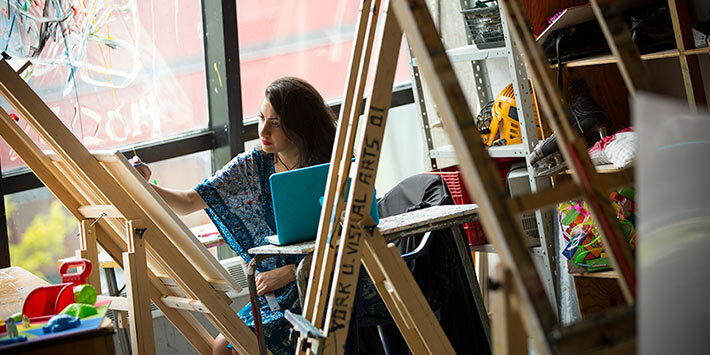 For advising or information on how to integrate the Minor in Arts, Media, Performance & Design into your studies, please contact AMPD’s Office of Advising and Integrated Student Services, 416-736-5135 or oaiss@yorku.ca. A total of 30 credits. 18 credits at 1st and 2nd year that must be taken in a minimum of two departments but could be spread across more departments. 12 credits at 3rd or 4th year which can be in one department or spread across several departments allowing you to design the education that meets your goals and interests. Any studies or studio courses open to non-majors. Some may require pre-requisites. The Honours BA Minor in AMPD may be combined with any approved Honours BA program that offers a major/minor option in the Faculties of Environmental Studies; AMPD; Health; Liberal Arts and Professional Studies; or the Lassonde School of Engineering. Can AMPD majors also complete an Honours BA MINOR in AMPD? Phone the OFFICE OF ADVISING AND INTEGRATED STUDENT SERVICES (OAISS) at 416-736-5135 or drop in between 10:00 am and 3:00 PM 322 GCFA to book an appointment. If I’m interested should I declare the minor? Absolutely YES! It’s to your advantage. Declare your minor as early as possible to ensure your course planning results in fulfillment of the requirements, such as pre-requisites for 3rd and 4th year courses. Where do I declare my minor? Phone OAISS, 416-736-5135, to make an advising appointment. An Advisor will help you create a pathway that meets your goals and interests and ensures you have the correct prerequisites.